Welcome curators! This guide describes some of the curatorial tools iNat provides as well as some of iNaturalist's policies toward how we curate our taxa. If you're not a site curator and would like to help curate our taxa, please contact us. We will generally allow anyone to be a curator if we know they have some expertise, or if they've demonstrated expertise by using the site. If you would like to be a curator but we don't know you and you have zero observations or identifications, we will probably ask you to use the site a bit more before approving your request. If you demonstrate by your behavior on the site or through your communication to us (the site staff) that you are unwilling to abide by our curatorial policies, abusive to us or members of our community, or otherwise unreasonable, we will revoke your curator status, or just not grant it in the first place. What constitutes abusive or unreasonable behavior is at the discretion of the site staff. Being a site curator means you have the power to make new taxa, edit existing taxa, alter our taxonomic tree, delete taxon names, and generally maintain the state of iNat's taxonomy. The site staff do some of this in broad strokes from time to time, but we don't have the resources to keep everything current all of the time, or to vet everything we get from our data partners, so some hands-on curation is required. Keep in mind that this document is both a how-to manual and a statement of our curatorial policies. If you cannot abide by our policies, we will start by warning you, but if you continue to reject our policies, we will remove your curator status. Everyone on iNat can add new taxa to the system by searching external name providers using the taxon selector or by using the box at the bottom of the search page. Curators can make new taxa directly by going to http://www.inaturalist.org/taxa/new or by clicking the "Create a new taxon link" in the Curation box on their dashboard. Each Taxon record has a name, but it also has many Taxon Name records that include its scientific names (current and outdated) and vernacular names. The name field for the Taxon record should be the accepted scientific name for this taxon. Please do not change the name of a taxon if you're trying to make a taxonomic change, e.g. replacing an outdated name with a new one. The appropriate way to do this is to use Taxon Changes. Just changing the name of a taxon will not preserve the history of the change and will not notify people about the name change. The only legit reason to edit a taxon name is to fix typos. Taxonomic rank, e.g. species, genus, family, etc. ID of the parent taxon. This is how you place a taxon in our taxonomic classification. You can use the Parent Name species chooser to select the parent like you would with any other species chooser on the site, but it's the ID that gets saved, so if you want to just paste in an ID you can do that. And of course there are caveats. For one thing, curators can't edit taxa above the order level. Changes toward the root of the tree create a ton of backend work that impacts site performance, so we stopped allowing it in July 2016. Also, these parts of the tree are pretty stable, so there's not much need to alter them. If you think these kinds of changes are needed, contact help@inaturalist.org. iNaturalist obscures the locations of all taxa with an IUCN equivalent status of Near Threatened or 'worse'. However, if in rare situations these species are thought to be in VERY LITTLE DANGER from exploitation due to the public's knowledge of the location of these species, curators are advised to change the geoprivacy value associated with the conservation status from 'obscured' to 'open' on the taxon edit page. Obviously, this is a gray area so if you feel compelled to un-obscure a threatened species be prepared to support why you are doing this. Why is the species not likely to be exploited by the public?, why is it of value to have the exact location accessible to the public?, etc. In Canada, where iNaturalist has a member of the iNaturalist Network that oversees iNaturalist.ca, NatureServe Canada's Conservations Data Centers (CDCs), establish and maintain the conservation statuses for each province and territory (except Quebec) that control the automatically applied "taxon geoprivacy". If any curator would like to make changes to the taxon geoprivacy for any national, provincial, or territorial unit of Canada (excluding Quebec), please contact Allison Siemens-Worsley (aworsley@natureserve.ca) NatureServe Canada’s National Data Support Biologist with the proposed change(s) and rationale. Allison will forward your request to the appropriate provincial/territorial CDC for review/response. Discussions between CDCs and curators should lead to an agreement that is favourable to both parties and biodiversity conservation. Curators must ultimately follow the recommendation from the CDC and are invited to discuss any concerns with the iNaturalist community in order to promote a broader discussion and identify alternative solutions that are agreeable to all parties. Each taxon has one name (the scientific name), as well as multiple Taxon Name records. Taxon Name records are used to store all the names associated with a taxon, including current and outdated scientific names and vernacular names in multiple languages. Each name must be unique for a given taxon and lexicon. On the taxon page, Taxonomy tab, you'll see a list of all names at the bottom of the page. Any iNat user can add common names using the "Add a name" link in the bottom right corner, but only curators can edit scientific names or delete names added by other people. The language and Place preferences in your account settings will change how common names are displayed on the site. We support one default common name globally, which can be changed by at the "Manage Names" page (taxon page, taxonomy tab) by dragging a name to the top of the list. You can also specify default names for specific places by editing the name and assigning it to a place, but please only do this when different places have conflicting names. Please be judicious when changing the default common name. Recognize that you may be displacing the name used by many other users. Common names for animals should be entered in title case with each word starting with a capital letter (e.g. Atlantic Bluefin Tuna) but not the second part of adjectival hyphenated words (e.g. Sulphur-crested Cockatoo). Common names for plants, fungi, and other non-animal taxa should be entered in lowercase (e.g. spotted gum) except for proper nouns, which should start with a capital letter wherever they appear (e.g. Tasmanian blue gum). NOTE: For reasons of style, iNaturalist often automatically displays common names in title case. However, common names should never be entered in sentence case (e.g. it would be entered as "mountain grey gum" not "Mountain grey gum"). Please don't add information to a name in addition to the name itself, e.g. "grumblefoots (this genus is monotypic, just ID to species!)." We use names in a lot of places for a lot of different reasons and adding extraneous information just makes them more confusing to users and more cumbersome to incorporate into designs (e.g. they might make it impossible to show a common name and a scientific name at the same time). If there is a real problem with misuse of a name, we would prefer to handle it in code and not in the name itself. Names, in general, should be as specific as possible, and common names are no exception. Most of us would agree that "mammal" would not be a good common name for the species Homo sapiens, so please don't add names like "snail" for some obscure gastropod with no real common name just because you think it will make it easier for novices to find. If anything, it will make it harder to find, since there are thousands and thousands of "snails." Instead, try to add names at the taxonomic level where they describe all members of that taxon and only members of that taxon. If a species has no common name in usage, please don't make one up. Please do not add common names for infraspecies that are identical to the common name of the parent species, e.g. if the species is Cola coke and it has the subspecies Cola coke ssp. classic and Cola coke ssp. zero, don't add the common name "Coke" for the subspecies. That will just confuse people who are trying to add an ID for the species Cola coke and make it harder for people who actually want to choose the subspecies. Instead, try to choose unique common names like "Coke Classic" and "Coke Zero." This also applies to regionalized common names (i.e. common names associated with places). If the only kind of cola available in Ireland is Coke Zero, don't add the common name "Coke" to Cola coke ssp. zero and associate it with Ireland. That name is still visible to everyone viewing English names, so someone in South Africa searching for "coke" and hoping to find the species Cola coke will see Cola coke ssp. zero even though that's not what they want. The people of Ireland will still be choosing the right species when they search for "coke." The people in Ireland who want to take it to subspecies can just learn to use the subspecific name (or better yet the scientific name). Note that there are a few uncommon situations where duplicate common names are ok, e.g. in situations where a species or subspecies really has a synonymous common name somewhere else. For higher level taxa it can be hard to use a common name that describes all descendants. In these cases, we usually go with something like "Herons and Allies" or "heath family." If you find names that don't meet these criteria, e.g. 10 taxa named "snail," please delete them without mercy. Replace one taxon with another. Use this for simple name changes where the new name describes exactly the same group of organisms as the old name, e.g. assignment to a new genus, fixing a spelling problem, etc. Merges several "input" taxa into a single "output" taxon, e.g. when multiple names are lumped under a single name. Suitable for combining a lot of synonyms at once. You could use swaps for this too, but merges just helps consolidate the description and sourcing. Splits a single "input" taxon into several "output" taxa, e.g. when a species has been revised and determined to contain several distinct, named species. Deactivates a taxon. You could also just edit the taxon and mark it as not active, but making a Taxon Drop allows you to explain and cite your sources. That said, just deactivating a taxon, whether with a drop or through direct editing, is almost never appropriate. You can almost always map a name to some other name. Drops are not a way to just get rid of names you don't like for some reason. Stages a new, inactive taxon for activation. Sometimes we (the iNat team) make sweeping semi-automated changes based on a taxonomic authority, and stages allow us to release a bunch of new names at once. Again, like drops, they are almost never really necessary. You should create a Taxon Change any time you want to change the existing taxonomy, e.g. renaming a taxon or marking it as an outdated synonym of another taxon (Taxon Swaps). You can do this by clicking the "New taxon change" button on the upper right of http://www.inaturalist.org/taxon_changes, or just going directly to http://www.inaturalist.org/taxon_changes/new. Before you create a new Taxon Change, check to see if someone has already done so by clicking "Taxonomic Changes" under "Extras" on the lower left of the taxon page. The single / multiple taxon boxes are a bit confusing. Every change has input and output taxa, so if you were replacing Hyla regilla with Pseudacris regilla, Hyla regilla would be the input and Pseudacris regilla would be the output. 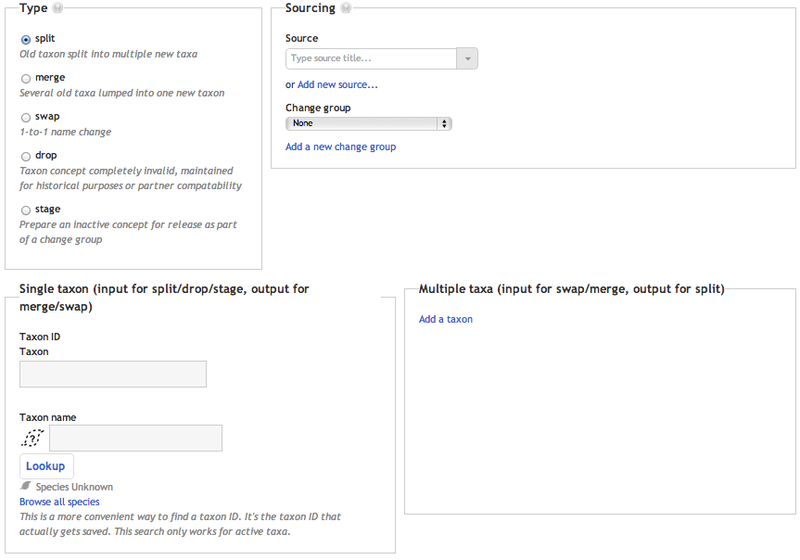 For Taxon Splits, there is one input and multiple output taxa, so the input goes in the "Single taxon" box on the left and the outputs go in "Multiple taxa" on the right. For Taxon Merges it's the other way around: multiple inputs, one output, so the output goes on the left and the inputs on the right. iNaturalist taxa represent taxonomic concepts, meaning taxa can represent different things even if they have the same name. So they should have distinct taxon IDs and distinct taxon pages. For example, this taxonomic change split Rhipidura fuliginosa into Rhipidura albiscapa and Rhipidura fuliginosa, but the older, broader concept of Rhipidura fuliginosa has a different taxon id (8161) than the newer, narrower concept with the same name (244276). So when making a taxonomic split or merge, make sure you first make a new taxon if necessary. If the new taxon bears the same name as an existing taxon, you will need to mark the existing one as "inactive" before the system will let you create the new one. When you save the Taxon Change it is in an "uncommitted" or "draft" state. You can review what observations will be affected by your change on the taxon change page (e.g. http://www.inaturalist.org/taxon_changes/31) and update your own content at the "commit for user page" (e.g. http://www.inaturalist.org/taxon_changes/31/commit_for_user). If you're unsure about your change, you can solicit feedback through comments on the taxon change or on a flag. Note that Taxon Changes represent changes within iNaturalist's taxonomy. While this should approximately mirror the direction of changes implied by the authorities we follow, they don't have to. For example, if Authority A says Vulpes vulpes is accepted, but there's a new paper that says we should call the species Supervulpes vulpes and somehow Supervulpes vulpes got added to our taxonomy, it would be ok to make a swap from Supervulpes vulpes to Vulpes vulpes, because Authority A says that's the current name. If a taxon change is likely to be controversial, starting a discussion before rather than after the change is prudent. This is where things get tricky. In theory, when a change only has one output, as with a swap or a merge, updating records is easy: replace uses of the input taxa with the output taxon. Except... some people want full control over their records and have opted out of these automatic changes. Plus we don't want to just change identifications in place because then we lose the history of what people really meant when they added an ID using an older taxon concept. And worst of all, splits have multiple output taxa, so we can't always choose what new taxon to assign to any given record. Swaps: Identifications of the input taxon get marked as not current and new identifications of the output taxon are added, unless the identifier has opted out. Observations get updated because of these identification changes. Listed Taxa get changed in place to use the output taxon. Copies of the photos, conservation statuses, ranges, atlases, and names associated with the input get moved to the output. Children of the input get moved to the output, unless the input and output have the same rank and that rank is genus or lower. The latter case means the children need new names (e.g. if genus Foo gets replaced with genus Zoo, species Foo bar needs to become Zoo bar). In this case, instead of moving the children, new swaps are automatically created for the new names. Merges: Just like swaps except conservation statuses, ranges, and atlases don't get moved to the output, since it's not always clear if those are still relevant to the new concept. Where output atlases overlap, or if there's ambiguity due to output taxa without atlases, we fall back to adding identifications of the closest taxon that contains all of the output taxa, so if the input is Woofer and the outputs are Canis and Vulpes, all IDs of Woofer will be replaced with IDs of Canidae, b/c it contains all of the outputs and should be implied by all of the previous IDs. This is a little weird, we know, but it makes it easier for people to add new identifications to shift the community ID correctly. If it's not already obvious, splits are the most disruptive kind of change. In the worst case scenario where some or all of the outputs are not atlased, observations of the input are going to get associated with some higher-level taxon and will need more IDs to become associated with one of the new outputs. This is probably going to be quite common, so if you split a taxon, please try and take responsibility for your change, review affected observations, and add new identifications where you can (there should be a banner on the taxon change page after you commit linking to a tool that will make this a bit easier). Many of the consequences of taxon changes can be undone by site staff if you make a mistake (like the new identifications), not all (like the listed taxa). That's why it's really important to be careful when committing a taxon change, particularly for taxa that a lot of people have been using. See the Policies below. We try to follow external authorities for certain groups in certain places. Please do not make changes that conflict with these authorities. Name changes are really frustrating, so if you can, explain why this name was changed. For splits, help people out by explaining how to differentiate between the output taxa so people know how to update their content if it couldn't be updated automatically. These practices are good for record-keeping, but they can also reduce the frustration and help everyone learn. We would like every change to be traced back to some publication or taxonomic authority. The ideal citation would be to the paper that introduced the change, along with a URL to that paper, but since that's often difficult or impossible to find without extensive library research, sourcing the change to a website or database is okay too. Since it's a pain to add a new Source record for every single page, it's often easier to set the Source as the website and include and specific URL to the page on that website that describes the change on the description. The goal is to ensure that anyone who wants to figure out why a particular change was made can trace it back. Keep in mind that the Encyclopedia of Life is not one of our taxonomic authorities! If you must cite them, perhaps because one of our authorities doesn't include an older synonym, please link directly to the relevant content, e.g. http://eol.org/pages/330496/names/synonyms. Try to @ mention others to review your changes for potential errors and to discuss whether or not they're appropriate. This is especially important if you're changing a taxon based on a regional authority and it has observations outside that region. Curators have a lot of power to act unilaterally because sometimes it's just hard or impossible to get others to vet your work, but we (the site staff) would prefer a more collaborative process whenever possible. While it may seem like the naming and classification of organisms is a formal process and all scientists agree on what names organisms should have, the truth is much messier. While there are standards for when and how an organism should be named, they do not apply to all taxa, and there are basically no universal standards for when two groups of organisms should be considered separate species. Biologists have never been able to agree on standards in these areas, so the result is much more akin to correct use of language than correct use of the periodic table: everyone has their own opinion, but most people tend to follow authorities (either individuals or groups) who they trust to make reasonable decisions about what names should be used. Thus, using names and classifications just because someone published a paper declaring that they should be used (even a peer-reviewed paper) is not a great idea, because it doesn't prove that the scientific community supports that paper's assertions. Or at least we don't want it to be. Since taxonomy is subjective, people argue about it all the time, and since there is no absolute truth one can apply to settle such disputes, they can become rancorous, often to the point of absurdity. Following taxonomic authorities helps us avoid having these arguments on iNat. We can argue about which authorities to follow, but following authorities allows us to skip arguments about each and every paper. iNat is largely a community of amateurs, and despite the advances made by open-access journals, the bulk of taxonomic literature is still prohibitively expensive for most amateurs to access. Avoiding the primary literature in favor of secondary taxonomic authorities, most of which are freely available on the Web, allows all our users to inspect the sources of taxonomic changes, not just the users with privileged access to the scientific literature. "What taxonomy do you use?" is often one of the first questions we get from researchers interested in using our data, if we're even fortunate enough to have that discussion. More often people find our data through aggregators like GBIF, so if we're using synonymous names that researchers or GBIF doesn't know about, researchers searching GBIF won't find our data. Following authorities moderates the pace of taxonomic change in our data and increases the probability that people searching through it by name will find what they're looking for. All that being said, there are also many situations in which we do not (or cannot) follow authorities. Sadly, many taxonomic authorities are incomplete and/or out of date, often because they are underfunded, understaffed, or suffer bizarre decisions borne out of financial or political issues that have nothing to do with taxonomy. Indeed, our own policy of following authorities has proven to be somewhat controversial, particularly for people who curate groups where there are either no authorities or the existing authorities suffer from some of these problems. The Reptile Database as a global reference with explicit discrepancies described here. Amphibian Species of the World as a global reference with explicit discrepancies described here. FishBase as a global reference with explicit discrepancies described here. World Register of Marine Species (WoRMS) technically counts as a 'regional' authority since it only includes marine species. It also includes species covered elsewhere (e.g. Cetaceans and Sea Turtles which are covered by the mammal and reptile authorities described above). However, for clades that are strictly marine it serves as a global reference. Also WoRMs does include some terrestrial species for some non-strictly marine clades. This is made clearer in the 'Global Species Database' section of the subregisters page. For example, see Mollusks below. Phasmida (Stick and Leaf Insects): Phasmida Species File Online. Follow the Stick and Leaf Insects Taxonomic Working Group here. Odonata (Dragonflies and Damselflies): World Odonata List. Follow the Odonata Taxonomic Working Group here. Plants of the World Online as a global reference with deviations described here. As of August 2018, current policy excludes following Plants of the World Online for ferns and genera that start with "P." See this journal post for more information. Sadly this is another group where there really is no global consensus, and names are changing rapidly, so for fungi we should try to follow the peer-reviewed primary literature. Index Fungorum is a decent source of names, and Species Fungorum has some information on what names should be current, but neither are up-to-date enough to satisfy most mycologists. Please be wary of IF ePublications, though, which do not require any form of peer review or supporting evidence for name publication. Same goes for Mushroom Observer, which is a fantastic site but supports a number of unpublished and provisional names. Esslinger's list seems to have the respect of North American lichenologists, and it gets updated yearly. For clades where all the members in a global external reference have been already added, often times most of the curation work to be done is cleaning up errors (e.g. synonyms automatically grafted from external name providers or from curators not aware of the taxonomic references being used). In these cases, iNaturalist may lock these clades down as 'Complete' which means it can only be edited by associated 'taxon curators' for that clade. A global external reference and any deviations from that reference explicitly mapped (e.g. as done here). One or more taxon curators willing/able to take on all ongoing taxon curation tasks such as keeping iNat in sync with the external reference, resolving flags and disputes, and if necessary making explicit deviations for controversial or disruptive changes. A working group project administered by the taxon curators to serve as a hub for curation issues relevant to the clade. Given their vague morphological delineation and taxonomic uncertainty, use of hybrid taxon concepts should be avoided whenever possible. Adding IDs of higher-level taxa is usually sufficient. In those rare cases when some external authority actually supports a named hybrid, we will tolerate it, but please abide by the following guidelines. Hybrids between species should have scientific names (the name associated with the taxon) following the pattern GENUS SPECIES1 × SPECIES2, e.g. Picoides scalaris × nuttallii for a hybrid between Picoides scalaris and Picoides nuttallii. The rank for such hybrids should be set to "hybrid." Note that the cross character is "×" and not the Roman letter "x." Hybrids between species in different genera usually receive a generic name that is a portmanteau of the two constituent genera and a novel specific epithet, so the name of a hybrid genus should follow the pattern "× NEW_GENUS," e.g. × Chitalpa, and should receive the rank "genushybrid." The hybrid species should follow the rules above, e.g. × Chitalpa tashkentensis, and its parent would be the genus hybrid, e.g. × Chitalpa. Hybrids should only be made between taxa of the same rank. Hybrids like Canis lupus × canis lupus ssp. familiaris don't make sense. That's like saying you made a new kind of vehicle by combining the traits of a Honda Civic and a car. 1. They fit into the taxonomic backbone - e.g. the Passenger Pigeon belongs to the extinct genus Ectopistes which nests neatly within the extant family Columbidae. But accommodating the extinct 'mammal-like reptiles' would require changing the backbone by inserting new nodes between the existing Subphylum Vertebrate and Class Mammal nodes or breaking up traditional (but non-monophyletic) basal groups used by Catalog of Life and GBIF such as reptiles. We prioritize taxonomic backbones that match external references over ones that can accommodate extinct groups. 2. The extinct nodes and all of its descendants are marked as Extinct by adding Extinct conservation statuses. Since this is a lot of work, curators may prefer to rather ungraft or inactivate extinct clades rather than do the work involved in marking the entire clade as extinct. If you care strongly about including an extinct clade, please be prepared to do this work yourself. There has been some confusion on iNaturalist about when it's appropriate to add additional taxonomic nodes beyond the familiar Linnean nodes (Kingdom, Phylum, Class, Family, Order, Genus, Species) such as subfamilies or tribes. While our general tendency is toward fewer nodes for the sake of simplicity, the heuristic we use is utility: if you feel some users on the site (including yourself) will benefit from having a subtribe in the system, perhaps because that's the lowest taxonomic level at which a particular insect can be identified based on a photograph, then go ahead and add it (provided you properly curate the node as described shortly). If you're adding a subtribe just because someone somewhere decided they like taxonomic units with less than 20 species in them, don't add it, because that doesn't really help anyone on iNat. Properly curated nodes on iNaturalist should have all of their children grafted beneath them. Lets use the plant family Proteaceae and its descendant genera as an example. The family node Proteaceae is green because all taxa within this clade are grafted as descendants rather than as siblings. In the above, the nodes for the subfamily and tribe are now red because only some, but not all of the iNaturalist taxa within that group have been grafted as descendants. The genera in yellow should be included in the tribe and/or subfamily but were not curated. Often it may be impossible to determine whether all iNaturalist taxa globally are descendants or sibling to an additional node. This is more and more likely to be the case the more 'obscure' these nodes become (e.g. section, subsection, subtribe etc.). As a rule of thumb, not including additional nodes in iNaturalist is preferable to including but only partially curating additional nodes as in the middle tree above. Please consider before introducing additional nodes: (1) are there global references that will enable curators to properly determine whether other taxa are siblings or descendants of the node? (2) are you willing to take the time to fully curate these other taxa? If during your curation you encounter partially curated nodes, it may be preferable to remove them rather than to fully curate around them if it is not possible or practical to fully curate them. Here's a tutorial on how to curate iNaturalist Taxon Ranges. Some databases are explicit about the taxonomic concept that their names refer to, and in many cases these are different. For example, in IUCN Pseudacris regilla currently means something different (a frog whose range extends from the Pacific Northwest to Baja) than Pseudacris regilla means in Natureserve (a frog just in the Pacific Northwest). Within iNat, we use Taxon Frameworks to keep track of which iNaturalist taxon is the one different taxonomic authorities are referring to. Any taxon that is covered by a sourced Taxon Framework should have a Taxon Framework Relationship. Only curators can create, edit, or destroy Taxon Framework Relationships. If the Taxon Framework has taxon curators (e.g. birds, reptiles, amphibians, mammals), only these taxon curators can create, edit, or destroy them. As of January 2019, this system is still in the process of being finalized. Places on iNaturalist represent physical places on Earth (no support for extraterrestrial places yet). When we started the site we pre-populated our places based on shapefiles from the US Census Bureau, the ESRI world political boundaries, and the California Protected Areas Database. We've run a few scripts since then to populate the database with some more places, but most of the rest come from user searches against the Yahoo GeoPlanet API. The remaining places were all manually created by users, and should show a "Place added" notice at the lower right of the place page showing who added it. Don't merge or delete places just because they look like duplicates. Try to figure out who added and is using a place before deciding it should go. Sometimes someone may have created a place that is similar to another but has a slightly different boundary because their project has different requirements. New places don't have checklists by default, because keeping checklists up to date is actually one of the most computationally intensive things we do, so we want to minimize the number of checklists. If you only want to add a place so you can search for observations within it, please don't enable the checklist. Places imported from Yahoo have no boundary defined, so even if they have a checklist, it won't be automatically updated by research grade observations. You can add a boundary by editing the place and using the map tools, or by uploading a KML file. However, if you upload KML, please don't upload really, really complicated polygons. If your places has several thousand nodes, consider simplifying the geometry before uploading. Our map editing interface is fairly primitive. Using ArcGIS or QGIS will be a lot easier. Note that all our place boundary data are stored in unprojected lat/lon coordinates using the WGS84 datum. Any iNat user can flag observations, comments, photos, identifications, and other sections of the website. They can also flag taxa that they think need curation. As a curator, you can see the most recent flags in the "Curation" box on your Dashboard or by visiting http://www.inaturalist.org/flags. You can browse taxa curation flags at http://www.inaturalist.org/taxa/curation. Try to deal with these issues if you can, and when you do, mark the flag as resolved so that it no longer shows up in the queue. We typically leave the following types of flags left unresolved: true spam flags, photos flagged for copyright infringement, duplicate observations, clearly spurious/malicious identifications. Below are some boilerplate text options you may choose to use when resolving flags for issues that occur frequently. Observation rather than photo is flagged as copyright infringement: Instead of flagging the observation, you can flag the photo directly as copyright infringement. This replaces the photo with a big "COPYRIGHTED MEDIA REMOVED" image and marks the observation as "casual grade." You can flag the photo by clicking the "i" (white circle) below the photo and clicking "Flag this photo" in the very bottom righthand corner of that page. Then choose "copyright infringement" in the pop-up and save. Thanks! Flagger indicates the photo on a taxon page is incorrectly identified: If you're positive a photo is identified as the incorrect taxon, then please correct this on the taxon page. If you click on "Curation" and then on "Edit photos," you should be able to remove the photo and then add a correctly identified one. alternate: I've removed this photo. If you're positive something is identified as the incorrect taxon, you're actually able to correct it yourself. On the taxon page, if you click on "Curation" and then on "Edit photos," you should be able to remove the photo and then add a correctly identified photo if one is available. Taxon is missing (but was able to be added automatically): If a species or other taxon is missing in the iNaturalist database, try typing the name into the identification field of an observation and choosing "Search External Name Providers." You can also search for it from the main searchbar on any page, click the "Taxa" tab, then scroll to the bottom where it says "Not Seeing What You're Looking For?" and click the search buttons in that section. This will try to import the name automatically from Catalog of Life and some other sources. If that doesn't work, it will need to be added manually by an iNat curator, and in those cases, feel free to flag it as you've done here. Thank you! Message was flagged as spam but user looks legitimate: Hi, iNaturalist's spam-detector flagged a message you sent as spam. This often happens when users send repetitious messages or include a lot of links to outside websites. Messages between users are private, so I cannot see the contents, but I thought I would let you know. If your account becomes suspended due to too many spam flags, just reach out to help@inaturalist.org and they will unsuspend it. Add or update taxon on place checklist: Note that anyone can add to place checklists to mark taxa as present or absent as well as native, endemic, or introduced to certain places. -Search for taxon where it says "Type taxon name"
Comment instead: (for only certain cases) ... Users aren't notified when their content is flagged, so it's best to leave them a comment or send them a message if you notice something wrong. We've defined inappropriate content in our FAQ (to the extent that such a definition is possible), and it will inevitably pop up from time to time. Curators can delete comments that seem inappropriate, but at present they don't have the ability to delete other kinds of records. Deleting another user's data is an action that should not be taken lightly, so comments should only be deleted if they are obscene, hate speech, insulting, threatening, or are clearly spam. We need a better system for dealing with this, but for now please send contact help@inaturalist.org if you find inappropriate content in observation descriptions, projects, journal posts, etc. Please keep in mind that pictures of pets, humans, obvious test observations, and drawings that depict the organism observed are appropriate, unless someone repeatedly posts such content. These kinds of observations are educational opportunities, so inform the person that iNat is primarily for sharing observations of wild organisms from nature by leaving a polite comment or private message. If 25% or more of a user's observations are of pets, humans, abiotic phenomena, or other off-topic subjects, or if they persist in this kind of behavior despite being warned, that constitutes abuse and you should contact the site staff at help@inaturalist.org, who will give the user 24 hours to remove the off- topic content, after which they will simply remove it for them. All that being said, a few off-topic observations here and there are ok.
An additional note regarding drawings: drawings are ok because, like photos, they can show visual evidence of the individual organism observed. If you don't think the drawing was of the observed organism (e.g. it's just a drawing of the species, not of an individual), talk to the observer and ask them to clarify what their drawing depicts. If they admit the drawing is not of an individual organism they observed, please contact help@inaturalist.org and the staff will ask the user to remove the photo, and remove it for them if they don't comply. If you cannot identify the organism from the drawing, treat it like a blurry photo and vote that the community cannot improve the ID. A troll is someone who hides behind the anonymity of the internet to purposely provoke a negative emotional response from other users, often by resorting to insults, jokes, spurious arguments, and other forms of norm-breaking behavior. On iNaturalist one example of the latter would be adding a number of intentionally incorrect identifications. Don’t bite — "troll" comes from the verb "trolling," a fishing activity where one drags a baited lure from a moving boat, hoping to get a bite. No matter how provocative, don’t respond in an emotional way - if you choose to respond at all. An emotional retort is exactly what the troll wants and you will only encourage their behavior. While some recommend responding with humor, this can be tricky unless it’s done just about perfectly, so we would advise against it. Encourage others to do the same — if someone has already responded in an emotional way, send them a private message asking them not post any more replies, and explain your reasoning. Engage the community — if the troll is making joke IDs on multiple observations, message a few other experienced users to, without comment, add correct IDs. Think twice about suspending the troll — Suspension can often backfire because it’s easy for a determined troll to keep making new accounts, and they will use the suspension(s) as motivation. Report trolling to help@inaturalist.org — iNaturalist staff can look into the situation and engage the troll, as well as possibly delete obscene/inappropriate content. Note that one-off jokes from students should not be considered "trolling" unless the behavior is widespread and antagonistic to other iNat users. In most cases these students are playing pranks on their friends and happen to be doing so on a public platform. Not appropriate behavior for iNaturalist, but it's not trolling. These are comments often posted on observations by site curators and other users as we try to help people learn how to use iNaturalist: https://www.inaturalist.org/pages/responses. Copy and paste responses from that page to save effort writing the same thing again and again. Curators can edit wiki pages like this one and the other help pages by clicking the "Edit" link at the bottom right of the page. You can create new pages by visiting the URL you want (e.g. http://www.inaturalist.org/pages/somepage) or by clicking to it from an existing page using the internal link syntax (e.g. somepage) and clicking the link. Wiki pages support full HTML as well as Markdown formatting. The Formatting box on the edit form will show you what's available.